When you sell a product as delicious as cookies, you might not need to market it aggressively to attract hungry consumers. But a little added allure sure can't hurt - and that's what businesses can do when they work with Lightning Labels to order and print premium cookie labels. Cookies come in all different sizes, from single-bite snacks to an entire meal all on their own; and luckily, Lightning Labels offers the customizable options to ensure your cookie labels fit your baked good perfectly. Our circle and oval labels come in a number of different dimensions - and we even have square labels if you're a real renegade cookie-maker - plus, our vast collection of label materials and laminates ensures your labels are top-notch. Cookies come in all kinds of delicious flavors: from chocolate, to double chocolate to even triple chocolate chip; macadamia nut; oatmeal and raisin; sugar; ginger; and the wonderfully named Snickerdoodle. 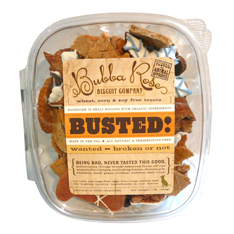 And for every cookie out there, there is an equally unique cookie label available from Lightning Labels. Our font, color, material, laminate and size and shape options allow you to have full control over design and customization so that your cookie labels look about as good as a fresh batch of peanut butter cookies coming out of the oven. Lightning Labels has been servicing the printing needs of our customers for more than 10 years. We are extremely proud of our BBB rating (A+) and guarantee your experience with us will be a positive one. Call us at 888-907-3004 today to place your cookie labels order and watch sales skyrocket!